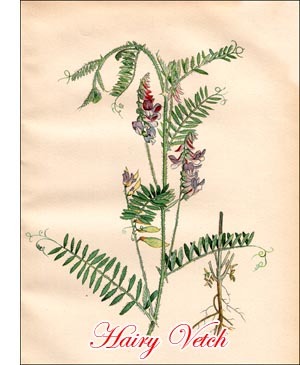 Other English name: Winter Vetch. As indicated by its name, this plant is a winter annual. It grows from two to four feet high, winding and trailing in all directions like Common Vetch, from which plant it is easily distinguished, even if no flowers are developed, by its hairiness, the whole plant being covered with long, soft, spreading hairs which often give it a white-woolly appearance. The leaves are compound, like those of Common Vetch, but the leaflets gradually taper towards the apex and the tendrils are more branched. The flowers are in rich, long-stalked clusters, smaller than those of Common Vetch and purple to pale blue in colour. Hairy Vetch is indigenous to Europe and southwestern Asia. Its cultivation in Europe began about the middle of the nineteenth century, at about which time it was introduced into North America. It is grown to a limited extent in Canada, almost exclusively in the fruit-growing districts of southern Ontario. Hairy Vetch does not require as good soil as does Common Vetch. It can be grown on poor, sandy soil, but will of course give heavier returns on rich, well prepared land. It is decidedly hardier than Common Vetch and stands southern Ontario winters without injury. It is generally sown in the summer, the exact time depending on the climate. The main object is to obtain a good stand before the cold weather begins. The plants pass the winter in southern Ontario without being killed and start growth early in the spring. In Ontario it is grown almost exclusively as a cover and green manure crop in orchards. It produces a great bulk of green matter and is apt to grow too rank to be easily ploughed under. Half a bushel of good seed per acre is sufficient to produce a fair stand of plants. When grown for seed it is either sown alone or with winter rye, which supports the vines and retards the splitting and curling of the early ripe pods because of which the yield of seed is always relatively small. The high price of commercial seed makes this desirable plant unpopular as a fodder crop. The seeds are somewhat smaller than those of Common Vetch, round, not flattened, varying in colour from dark brown to greyish black.